Jalandhar: The School of Pharmaceutical Sciences at Lovely Professional University is organizing two-day International Conference of Pharmacy (ICP-2017) at its campus in collaboration with Society of Pharmaceutical Education and Research (SPER). Under this massive conference, 500 + delegates from across world & India, representing both academia and industry, have registered for participation; 255 research papers have been selected to get published in Scopus indexed Journals; and, 220+ posters and oral presentations are included to illustrate important role of pharmacy in modern life. The topic covered is ‘Pharmacists: Catalysts for Change’. National Award Winner, Dr T.C. 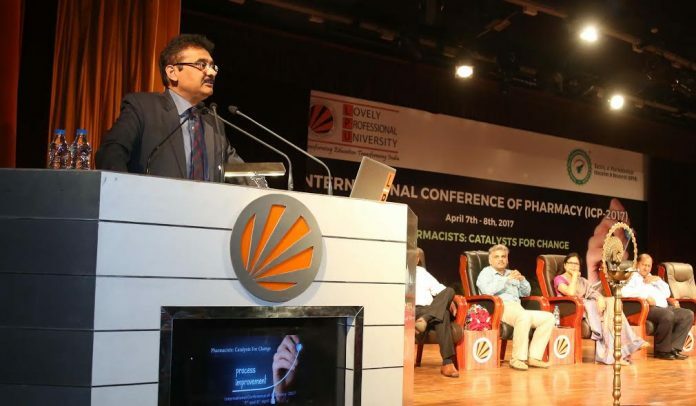 Kansal advised pharmacists to popularize the pharmacy profession by always remaining sincere towards it and keep on providing the best possible services to the suffering humanity: “Be good, honest, purposeful pharmacists whom the society urgently needs.” Appreciating the unflinching support of LPU in organization of the conference, Dr. Nagaich requested all to have great impact factor in their respective research works. Opening the scientific session of the day, Prof. Dr. Banakar of USA touched the topic ‘ Dissolution Testing & Technology: Opportunities & Challenges’ and elaborated in a unique and layman’s language to all what a true innovation, invention, inherency, or novelty means in the field of research works and how patents can be applied. Another key speaker of the day, Dr Rajan from Ooty shared about his research endeavours for Herbal formulations, Bio-pharmaceutics and Pharmacokinetics. On the conclusive day of the conference, Senior Vice President of Cadila Pharmaceuticals Dr. B.S. Chakraborty, Assistant Drug Controller Dr. Pardeep Mattu and more will chair different scientific sessions. Illustrative, SPER is a scientific, educational and professional non-profit organization committed to promote the highest professional and ethical standards of pharmacy and to work for the growth, development and betterment in the field of pharmacy.